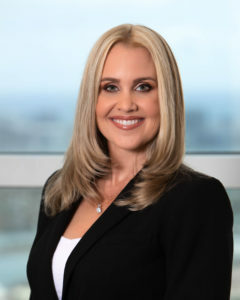 Miami partner Miranda Lundeen Soto recently was a panelist in the American Inns of Court SuperStars Mock Trial titled “Ghost Defendants.” This program featured three dozen of among the most experienced and successful litigators and judges in South Florida. Miranda participated as a panelist during the “Jury & Judicial Feedback” portion. The mock trial took place at the Neil Simon Theatre at the Biltmore Hotel & Spa. Miranda Lundeen Soto is a partner in the Miami office of Shutts & Bowen LLP, where she is a member of the Business Litigation Practice Group. Miranda is Florida Bar Board Certified in Civil Trial Law and has tried more than 50 cases, bench and jury trials. Her practice includes from commercial and business disputes, professional and legal malpractice claims, product liability, complex fraud matters, public policy matters, cases of first impression, high-stakes personal injury cases, franchisee/franchisor litigation, trust and estate litigation and premises liability at the state and federal levels.